The fragrant, white blossoms diffuse a characteristic floral scent into the landscapes. Gardenia is best suited in smaller beds or garden spaces—even large containers—where you can ensure nutrient-rich soil. 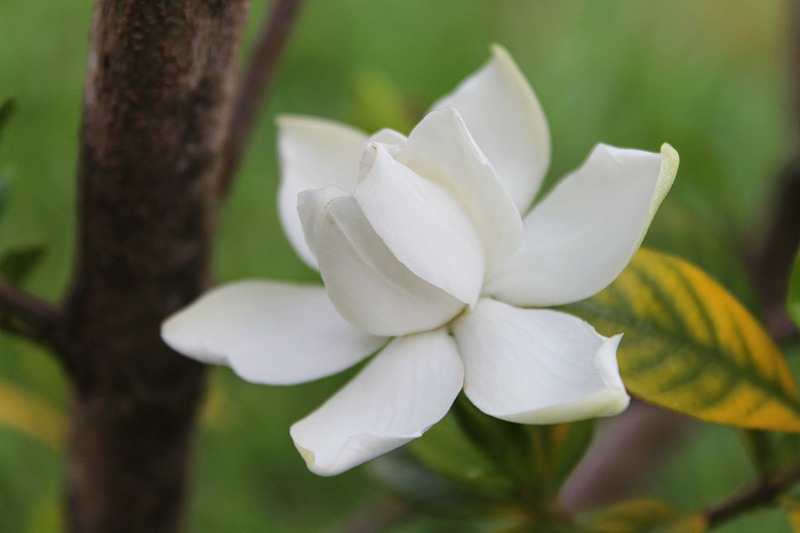 Unfortunately, the sandy soils we have here in South Florida can make growing many great-smelling plants like Gardenia a challenge, because they need rich, healthy soils to thrive. (More on that below when we address maintenance.) So, plan on fertilizing regularly and treating for pests. Your reward for this TLC is an aromatic beauty. This evergreen shrub can grow up to 10 feet high and spreads about 6 feet wide. What’s interesting about this fragrant plant is that it blooms after dark, so it’s a great addition to your patio or poolside landscaping, where you can enjoy some evening, scented foliage. Just be sure to plant it in partial shade and fertilize it regularly. It, too, must have nutrient-rich soil to thrive. This tree loves South Florida’s hammock and the Keys. Its fragrant bark peels off, making the trunk texturally interesting and pleasant smelling. The cinnamon bark tree blooms with red cluster flowers, and the tree’s berries ripen to a red at the end of its branches. This isn’t the same cinnamon tree used to make the spice you use in your kitchen, but the bark’s scent carries that savory cinnamon smell. Add a fragrant green wall to your landscape by planting Arabian Jasmine on a trellis, arbor or pergola. It has a glossy foliage and clusters of flowers in white, yellow or red. This spreading shrub is an ideal ground cover because of its vine-like growth. It blooms large, fragrant pinwheel shaped flowers that are white with purple accents. 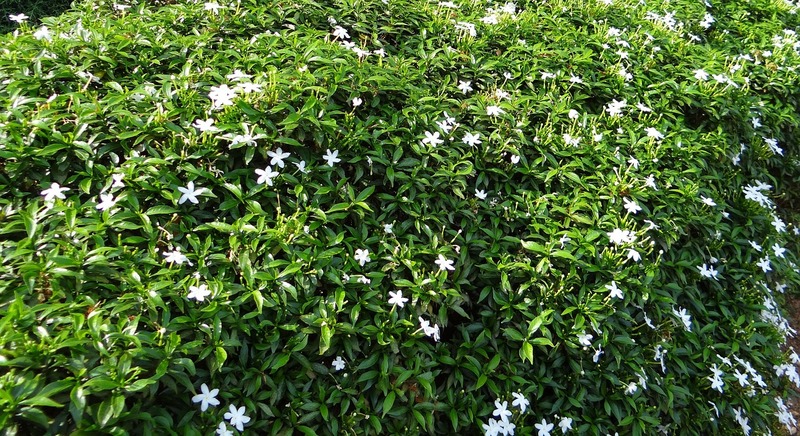 While not all jasmine flowers are fragrant, you can count on the Angel Wing to bring a sweet smell to your South Florida property. This plant is native to China and a fast-growing vine that will climb up trellises, arbors and other structures. (Be careful not to plant it too close to trees unless you want a trunk wrapped with its tendrils.) The flowers of Confederate Jasmine are small and white—but size says nothing about the fragrance this plant brings to the landscape. It is very aromatic and can create a sweet-smelling garden wall. This compact flowering shrub puts out spires of white blooms that are the length of your finger. When you get close to the tree, you can smell the sweet almond scent. This smaller tree will grow up to about 40 feet tall and produces large leaves that are up to 8 inches long—and responsible for the delicious allspice scent. The tree grows small white flowers that turn into a brownish berry, which can be picked and dried for use in cooking. Because the tree is slow-growing, it won’t outpace other plants in your landscape despite its size. Smaller than the allspice tree, and in the same family, the Bay Rum is similar in how its fragrance is held in aromatic leaves. Bay Rum’s essence has been used in men’s cologne. The tree produces small, white puffs of flowers that turn into oval-shaped black fruit. If you know Chanel No. 5, you’ve smelled the fragrance of Ylang Ylang, a tree that’s native to China and grows well here in South Florida. This larger specimen can grow up to 50 feet tall and produces starburst like flowers. Its scent is known as an aphrodisiac, and oils from this tree are used to alleviate anxiety and lift the mood. Each of these 10 fragrant plants can thrive in your South Florida landscape—if you commit to watering and feeding them. Because these aromatic species tend to come from tropical environments like the Caribbean, where the soil is nutrient-rich, they are accustomed to very fertile soil. However, here in South Florida, our sandy soils lack the nutrition that many of these sweet-smelling plants need to sustain themselves. This is why regular maintenance and care is critical: fertilization along with disease and pest prevention. We have planted all of these beautiful, aromatic plants on South Florida properties and they do well when properly maintained. Call us to find out more. You can talk to one of our landscape professionals at 305-367-2005, or fill out this simple contact form and we’ll get in touch with you.